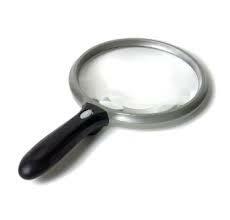 The hand held 5 inch round lighted magnifier evokes the great literary detective Sherlock Holmes. It updates a classic look with a black, ergonomic handle, silver-tone lens frame. The circular frame contains a bright LED. This is a large round magnifier, with 2x magnification overalls and a small powerful 6x magnification area. It can handle large-scale projects down to the finest detail. The lens frame projects out on both sides, protecting the lens surface when set down. The crisp, white LED light enhances subtle detail and increases the contrast of text. A great help if poor eye sight or limited vision. It will also help when you need to see in better detail. The LED lasts 100,000 hours. well made,clear view of what you are looking at.the in built light works well.